"Animals and plants provide us with a wealth of experience about some incredible features. We want to transfer the mechanisms behind them to artificial materials, to be able to control their behaviour in a targeted manner," said the zoologist Gorb. Their goal of a reversible adhesion in the micro range without traditional glue could make completely new application possibilities conceivable – for example in micro-electronics. In a first step, the research team compared silicone elastomers of three different surfaces: one unstructured, one with pillar-shaped elements and a third with a mushroom-like structure. Using a micro-manipulator, they stuck a glass ball onto the surfaces and then removed it again. They tested how the adhesion changes when the materials with microstructured surfaces are bent convex (inwards) and concave (outwards). 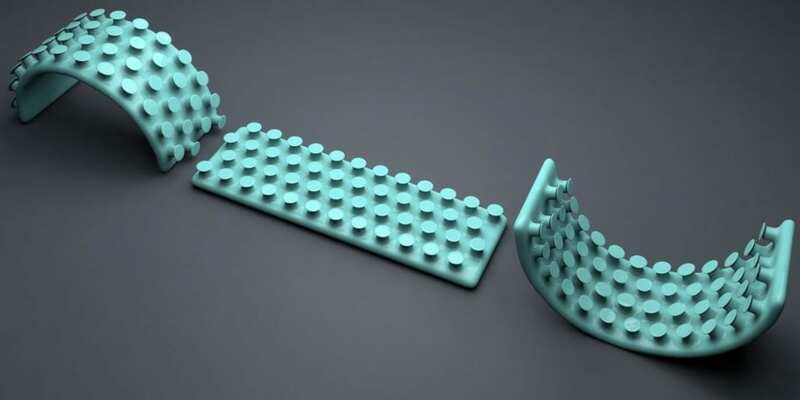 "In this way, we were able to demonstrate that silicone materials with a mushroom-like structure and curved concave have the double range of adhesive strength," said doctoral researcher Emre Kizilkan, first author of the study. "With this surface structure, we can vary and control the adhesion of materials the most." To find out how plasma treatments can significantly improve the adhesion of a material without damaging it, the scientists varied different parameters, such as the duration or the pressure. They found that the adhesion of unstructured surfaces on a glass substrate increased by approximately 30% after plasma treatment. On the mushroom-like structured surface the adhesion even increased by up to 91%. "These findings particularly surprised us, because the structured surface is only half as large as the unstructured, but adhesion enhancement was even three times better after the plasma treatment," explained Kizilkan. "We therefore have on a very small area an extremely strong adhesion with a wide range," summarizes the material scientist Kizilkan. This makes the results especially interesting for small-scale applications such as micro-robots. The findings of the Kiel working group have already resulted in the development of an extremely strong adhesive tape, which functions according to the "gecko principle", and can be removed without leaving any residue. The studies were conducted within the framework of the Collaborative Research Centre 677 "Function by Switching" at Kiel University. Caption: Different configurations change the adhesive effect of the silicone material, whose surface has been given a mushroom-like structure. The adhesion is best when bent concave (right). Caption: Using a scanning electron microscope, Professor Stanislav N. Gorb (rear) and Emre Kizilkan take pictures of the surface structures with only a few micrometers in size. Caption: Under a scanning electron microscope, the surface of the silicon elastomer with its mushroom-like adhesive elements becomes visible. They are inspired by the microstructures on the feet of certain species of leaf beetles. Caption: Silicone surfaces treated with plasma (below) have stronger adhesiveness than untreated surfaces (above). The material only separates from the glass surface after 50.4 seconds (I), while the untreated material already separates after 32.8 seconds (D).